Flavors exploding with every bite; includes a healthy homemade dressing! First, place 1 portion of Atlantic salmon (6 oz) on a baking sheet and bake in the oven at 350 F for 17-18 mins, or until it flakes. While thatâ€™s baking, wash and dice the raw brussel sprouts, cherry tomatoes, and apple. Mix the diced produce in a bowl with the sunflower seeds and currants (or raisins). This is the salad base. Make your Caesar dressing by mixing the remaining listed ingredients. Pour your dressing in the bowl (I used about 2/3 of it and saved the rest to add later if desired) and mix everything thoroughly. 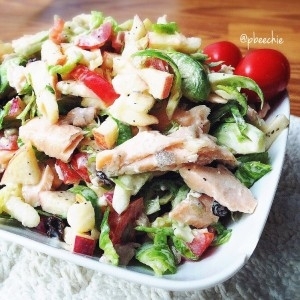 Once the salmon is cooked, flake it into the salad bowl and mix in evenly. Serve cold!